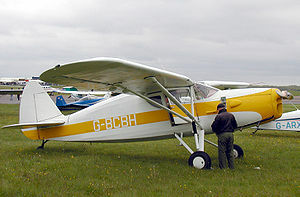 Picture - A Fairchild 24W-40 with a 165hp Warner engine. The Fairchild Model 24, was a four-seat, single-engine monoplane light transport aircraft that was used by the United States Army Air Corps as the UC-61 and by the Royal Air Force. The Model 24 was itself a development of previous Fairchild models and became a successful civil and military utility aircraft. Fairchild Aircraft was hit hard by the Great Depression in the early 1930s as airline purchases disappeared consequently the company attention turned to developing a reliable and rugged small aircraft for personal and business use. The Fairchild 22 became somewhat of a hit and led directly to the new and much improved Model 24 which gained rapid popularity in the early 1930s, noted for its pleasant handling characteristics and roomy interior. Having adapted many components from the automotive industry (expansion-shoe brakes and roll-down cabin windows), the aircraft was also affordable and easy to maintain. In production continuously from 1932 to 1948 the aircraft remained essentially unchanged aerodynamically and internally, with the simple addition of extra passenger seating and optional equipment. The first models were equipped with only two seats, but in 1933 a third seat was installed and by 1938 a fourth was added. The interior was first created for the Model 24 in 1937 by noted American industrial designer Raymond Loewy. A minor airframe revision was made in 1938 with the redesign of the vertical fin and re-designation from C8 to F24G onwards. In an innovative concept, the aircraft was available with two powerplants, Warner's reliable Scarab and Fairchild's in-house 200 hp Ranger series in the F24C-8-D, E and F. Initially the 1932 model Fairchild 24C-8-B used a reliable and popular Warner 125 hp radial engine, and the Fairchild 24C-8-C used the Warner 145 hp radial. American Cirrus and Menasco Pirate inline engines were also occasionally used in some earlier Fairchild 24s. Later models such as the popular 24Ws upgraded to the 165 hp Warner Super Scarab. Designed for operations from relatively unimproved grass airfields, the sturdy undercarriage construction used a vertical oil dampened cylinder above the wheel with a pivoting strut attached to the lower fuselage. The result was a complex but undeniably solid undercarriage that could absorb large amounts of shock and was also adapted for the fitting of twin floats for water-based operations. The sturdiness of construction of the aircraft has ensured many have survived to this day. Some suggest the massive spruce main-spars can be loaded up to 10g, and while that figure is unproved, all pre-war utility category aircraft were designed to withstand at least 4.1g as opposed to the 3.8g post-war design limit standard. The Fairchild 24 built by Kreider-Reisner Aircraft, Hagerstown, Maryland, a division of Fairchild Aviation Corporation, remained in production from 1932 to 1948, essentially the same airframe but with various powerplant and configuration enhancements. In all, Fairchild constructed over 1500 Model 24s, with an additional 280 being constructed by the Texas Engineering & Manufacturing Company (TEMCO) in Dallas when that company purchased the manufacturing rights after World War II. In civil use, the aircraft was a quick sales success with prominent businessmen and Hollywood actors purchasing the aircraft. In 1936, the US Navy ordered Model 24s designated as GK-1 and JK-1 research and instrument trainers. The type was also used by the US Army as a light transport and by the Coast Guard, with the designation J2-K. The Civil Air Patrol operated many Fairchild UC-61/24s and some aircraft were fitted with two 100 pound bombs for what became successful missions against German U-boats off the east coast of the United States in the early stages of the Second World War. The UC-61 was also procured by the US Navy as the GK-1 and by the British Royal Air Force as the Fairchild Argus. In 1941, the United States Army Air Force (USAAF) placed an initial order for 163 Fairchild C-61s, however via Lend-Lease, 161 of these were shipped abroad. Under the auspices of this program, the majority of the 525 Warner Scarab Fairchild 24s/C-61s went to Great Britain. Most of these aircraft saw service as Argus Is and improved Argus IIs and were allocated to a newly formed adjunct of the Royal Air Force (RAF), the Air Transport Auxiliary (ATA). An additional 306 Ranger powered Argus IIIs were also used by the ATA. In British service, the majority of the Argus type operated with the ATA ferrying their aircrew to collect or deliver aircraft to and from manufacturers, Maintenance Units (MU)s and operational bases. The Argus I was a Warner Scarab equipped aircraft identified by its wind-driven generator located on the starboard struts, and was equipped with a black-painted propeller. The Argus II was also a Scarab powered aircraft, usually with a transparent cabin roof. This mark was certified for heavier operational weight than the Mark I and was identified by its yellow propeller. The Argus III was equipped with the six cylinder inverted inline Ranger engine. The aircraft served with military forces as diverse as Finland, Thailand, Israel, Canada, the United States and Australia and to a lesser extent, commercial operators. The last "new" Fairchild 24 was assembled in 1948 from a large inventory of leftover parts in Winfield, KS. Ten Fairchild F24R aircraft operated for Comair (South Africa) during the period after the Second World War. Military version of the Fairchild Model F24W-41 powered by a 165hp R-500-1, 161 built. Military version of the Fairchild Model F24W-41 with radio and 24-volt electrical system, 509 built and three impressed civilian aircraft. One impressed Model 24J powered by a 145hp Warner Scarab radial. One impressed Model 24H powered by a 150hp Ranger 6-410-B. One impressed Model 24-C8F two-seater, powered by a 150 hp Ranger 6-390-D3. Final production variant powered by a 200 hp L-440-7, 306 built. Nine impressed Model 24R-20s bowered by 175 hp L-410. Thirteen Model 24W-40 impressed by the United States Navy. United States Coast Guard version of the Model 24R, two built. As J2K-1 with detailed changes, two built. Converted military aircraft became popular postwar as personal transports and many survive to this day. Extremely solidly built, the aircraft survives in reasonably large numbers. Primarily, this popularity is probably due to affordability. Prices for low hour examples of the aircraft typically range between US $50,000 to US $90,000 (2006 values) and some of the most pristine examples can be seen annually at the Experimental Aircraft Association fly-in at Oshkosh, Wisconsin. Aircraft museums worldwide are restoring examples for display (such as G-AIZE at the Royal Air Force Museum at Cosford).